Healthy and Gourmet: Brownies baby! 1. Set oven to 325 degrees F. Grease a 9 x 9 baking pan. 2. Combine flour, cocoa powder, and baking soda. Set aside. 3. Whisk together vegetable oil, brown sugar, eggs and vanilla extract. 4. Meanwhile, in sauce pan heat milk and chocolate chips until all the chips have melted. Remove from heat and allow to cool. Slowly add to sugar mixture while whisking. 5. Add flour mixture to chocolate mixture and whisk until just combine. Fold in remaining 1/2 cup chocolate chips and chopped pecans. Pour batter into baking dish and bake in a 325 degree oven for 30 minutes. At this point, an inserted toothpick will probably not come out clean but this does not mean that the brownies are not cooked. Set on a wire rack for 10 minutes, then cut into cubes. Thanks Natnibbles. For this recipe, I folded in extra chocolate chips just before baking for extra richness. 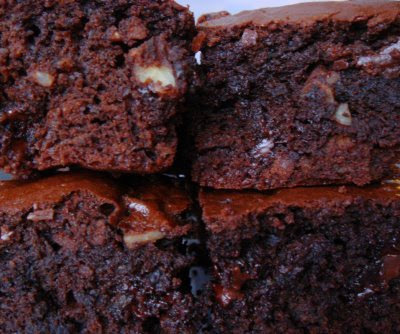 You can never have too much chocolate in brownies! Wow, these look like heaven on a plate. I love brownies with chocolate bits/chips in them. I am definitely going to try these. Thanks for sharing!! !